Oath of office: ‘I swear that I will dedicate my efforts to the benefit of the people, promote their welfare, protect them from harm, uphold and defend Constitution and law, perform my duties conscientiously, and do justice to all. So help me God. 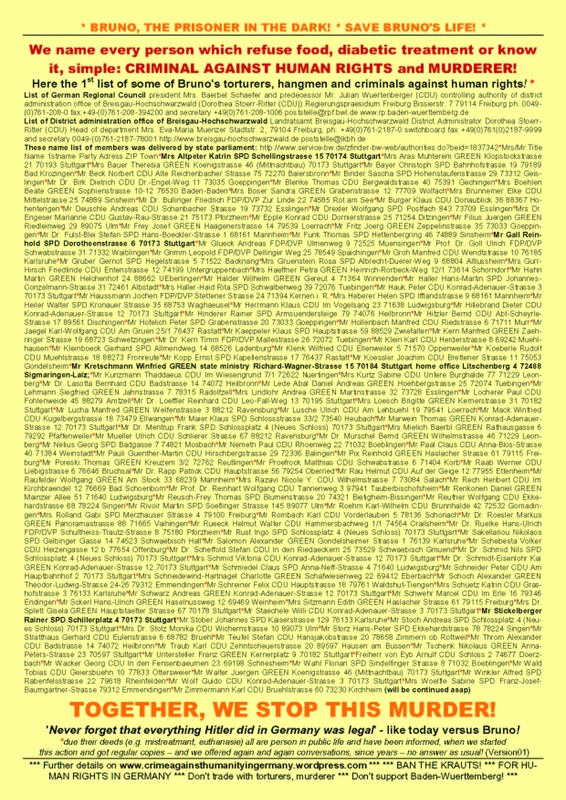 (Article 48 of State Constitution)’ = all are highly, tax paid perjurer! 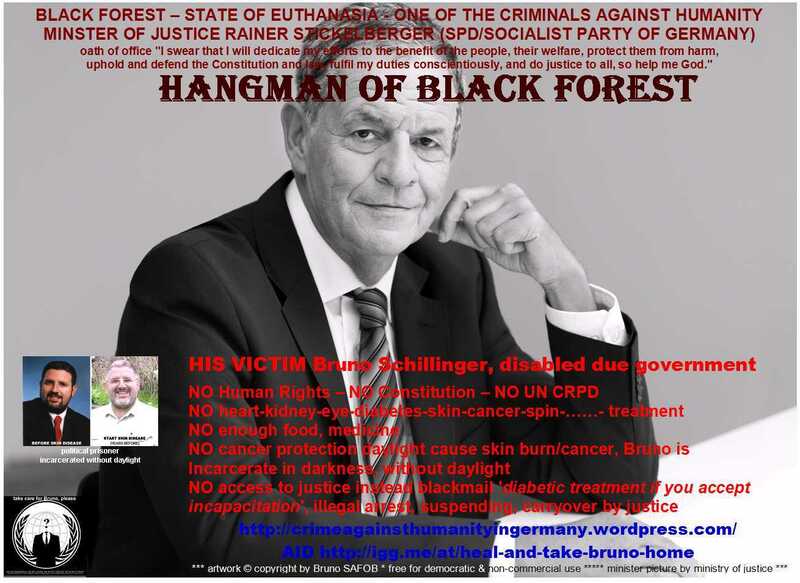 ALL MP accept refusal of food, diabetic medicine due own public authorities is neither attempt murder, nor any other crime – so ALL started the new euthanasia after III. 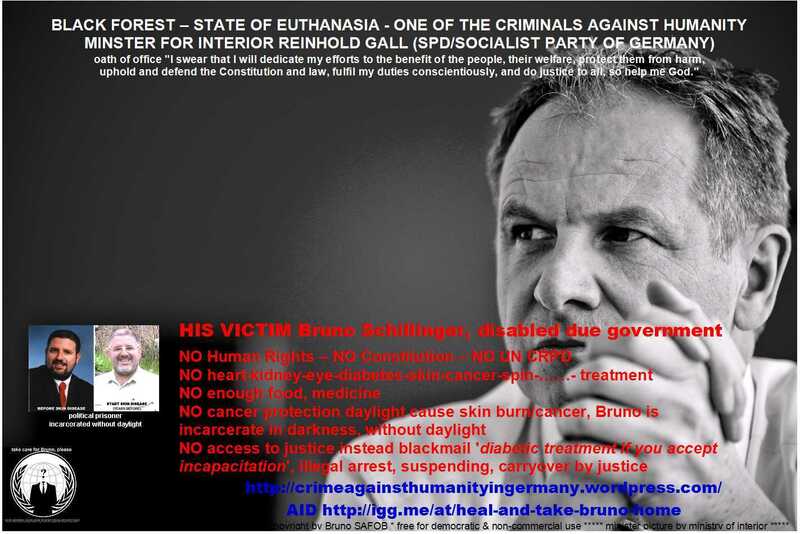 REICH (Nazi era) – some MPs threatened Bruno. Prosecutors must follow the orders / instructions of politicians. These commands can given verbally, must NOT be given in written form. 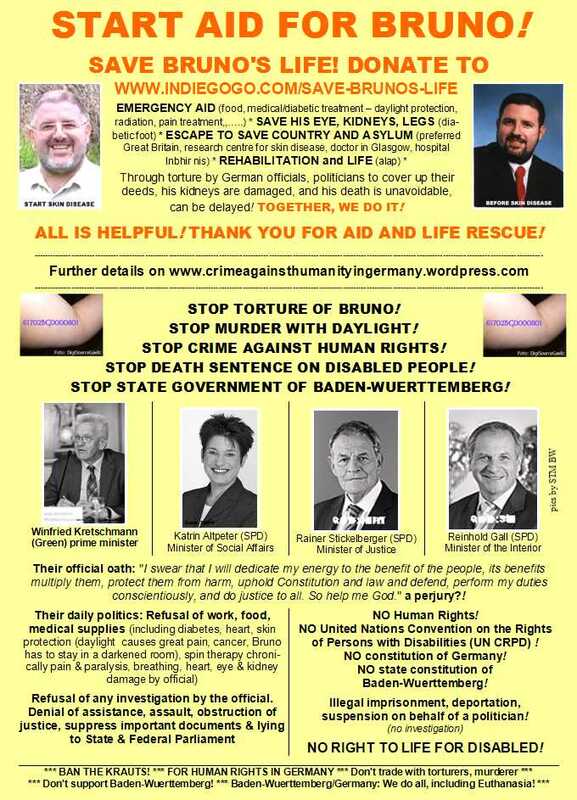 Politics & Justice has learned from the war crimes trials in Nuernberg. 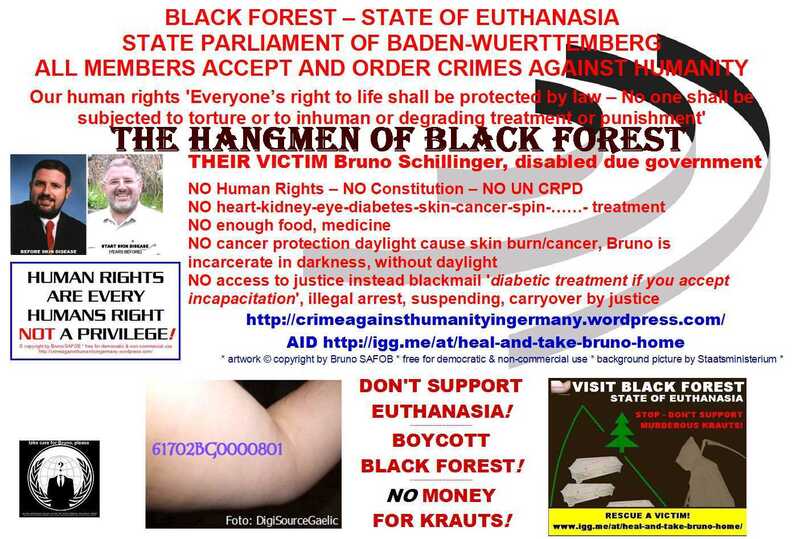 Germany = special law area, against humanity! Each officer, … has made ​the oath of office to German Constitution and Human Rights and know that they can make a complaint against seeking order and commander and has to do it! Local police refused to take complaints (CRIME) and explained loud laughing, that he doesn’t need take complaints, because attorney will generally close the case, write you a letter and when you don’t protest all is closed and you can’t protest – the policeman exactly know about eye damage, no reading loud machine, no support and so he doing and support new crimes. 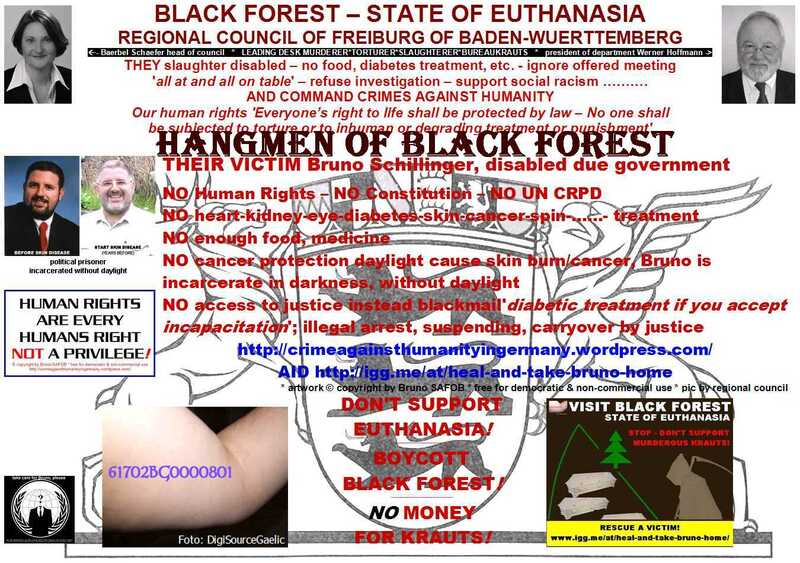 Accepted, legalized by chief of police Mr. Rotzinger [chief no direct link, not even about search function & police headquarter – press portal] and prime minister Kretschmann. We ask , as always, by telephone confirmation of receipt plus file number ! Other points / details Mr. Schillinger want to explain to the transcript – which is so far denied him . We are forced to repeat this again . 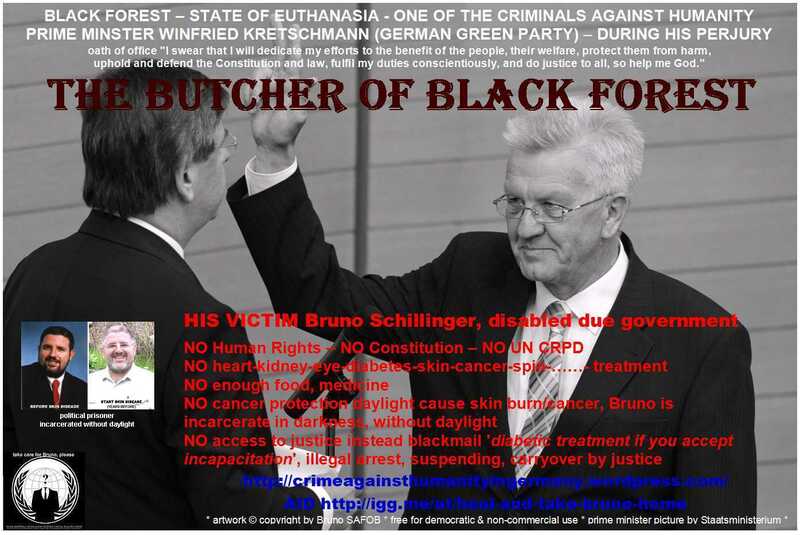 NO attorney never phoned/contacted Bruno Schillinger – they refused ‘access to Justice‘ (UN CRPD=German Federal Law) and proofed that they criminals! 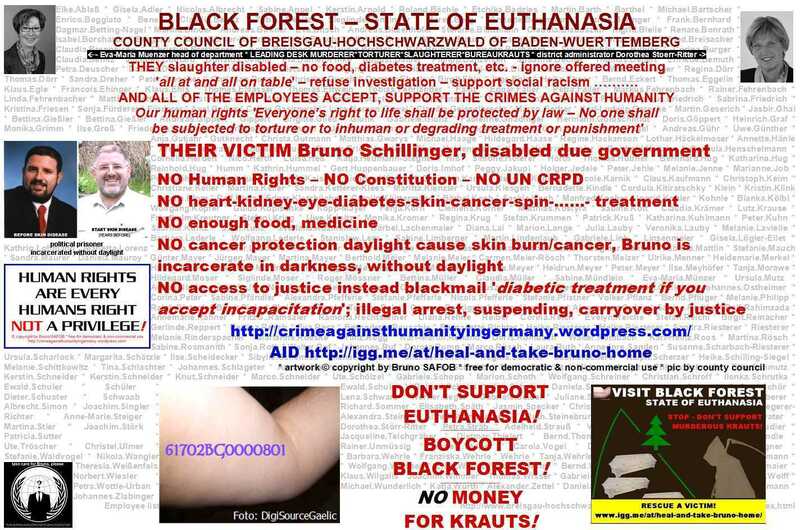 District Council is supervisory authority of Jobcentre Breisgau-Hochschwarzwald and Village March and has to support poor, disabled,…. 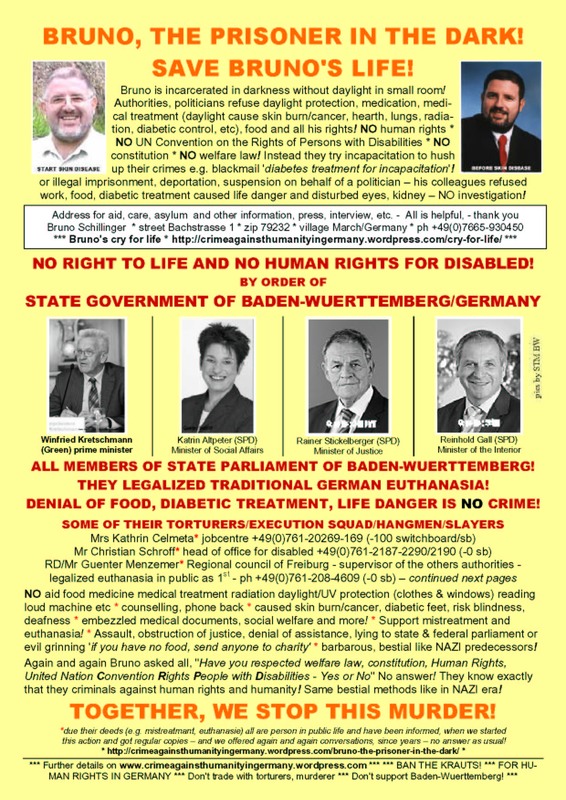 leaded by Mrs. Stoerr-Ritter CDU [LINK & Wiki] – same party like mayor or the dubious politician – she is hiding behind desk, we often claimed for investigation and their responsibility, but it is easier to murder human behind save desk and not see in eyes. They accept e.g. suppression of documents (criminal code §247 up to 5 years jail). The inhuman, murdering, Nazi-Regime was stopped on May 08. 1945 – but did you konw that most judges, bueraukrauts, …. weren’t denazified? A.N.D. A.L.L. W.O.R.K. A.G.A.I.N.S.T. H.U.M.A.N.I.T.Y. 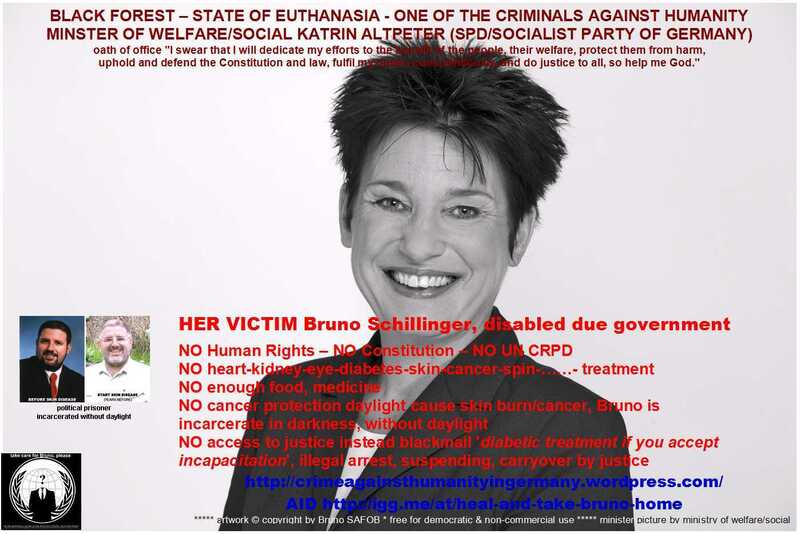 Und die Mörder von Bruno Schillinger & Verbrecher gegen die Menschlichkeit – durch Schweigen! Zur Information und Aufforderung Soforthilfe zu leisten und die Menschenrechte zu schützen! For information and invitation to provide immediate relief and to protect the human rights! And of any , person who is informed, involved in each authority , etc! Und an jede informierte, beteiligte Person in jeder Behörde, usw. !